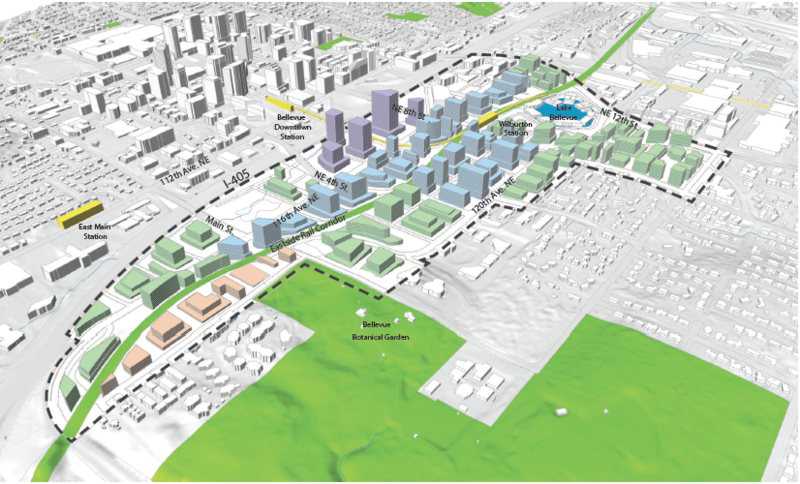 Bellevue is considering an upzone of the Wilburton area east of Downtown across I-405. A draft EIS, currently open for public comment, examines much greater height and more intense urban activity. The Citizens Advisory Committee is also looking broadly at development standards and public investments to improve the livability of the city’s traditional Auto Row. The area, despite being so close to downtown, is relatively underdeveloped. Apart from a hospital cluster in the northwest, it’s largely a mix of auto dealerships, big box retail, and older strip malls. Existing zoning generally allows development between 35 and 70 feet (excepting the hospital where allowed heights range up to 200 feet). That has not been enough to induce much developer interest and Bellevue anticipates little future growth under the no-action scenario, with the current 3.6 million square feet of development expanding to just 4.2 million by 2035. Both alternative scenarios in the draft EIS envision much greater development, with more street connections, smaller blocks, and a much greater concentration of activity. They differ mostly in the permitted scale of urban development. The medium development scenario sees 13.1 million square feet of development by 2035. Building heights would vary between 35 and 250 feet, with typical developments between 120 and 160 feet. The higher development scenario has 16.3 million square feet of development and a more urban form across the neighborhood. Building heights of 300-450 feet would be permitted in the core around 6th St. Most buildings elsewhere would be between 200-250 feet or 120-160 feet. Either scenario leaves room for future development beyond 2035, with the higher development Alternative 2 eventually maxing out about 22 million square feet. As a rough perspective on that scale, Amazon currently occupies 10 million square feet of office space in Seattle (Wilburton would, of course, be a mix of office, residential and other uses). A fully built out Wilburton is set to be an important regional activity center. Several elements have come together to amplify the potential for future development. Downtown Bellevue is booming, but increasingly near capacity and hemmed in by the lake to the west and single-family neighborhoods north and south. To the northeast, the Bel-Red Corridor is also seeing increased development, placing Wilburton “in the path of growth”. Sound Transit rail will serve the area in 2023 and I-405 BRT in 2024. The Eastside Rail Corridor is being built out as a vital walking and biking connection, and interim trails are planned to be largely in place by 2020. The Eastside Rail Corridor is a rather unique element of the developing neighborhood. Effectively, it will serve as a north to south multimodal spine, connecting Wilburton to Bel-Red and beyond to Kirkland, Renton, and the regional trails system. Complementing the ERC is the “Grand Connection“. This is an east-west pathway from Meydenbauer Bay to the ERC. Most immediately, it could go a long way toward addressing the paucity of safe and comfortable ways for bikes and pedestrians to cross I-405, connecting the center of the Wilburton neighborhood to the transit center and the NE 6th St pedestrian corridor. Perhaps excepting NE 12th St, all crossings of I-405 today in central Bellevue are terrible, with skinny sidewalks meeting high-speed traffic and freeway off-ramps. 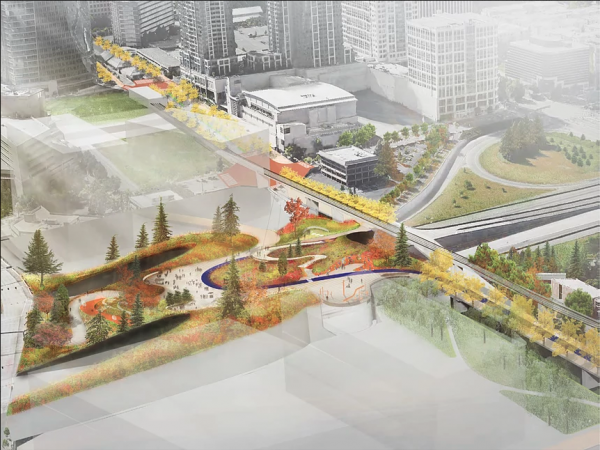 The crossing of I-405 could be a bridge or a park lidded over I-405. Sound Transit is building one rail station at the north end of the Wilburton subarea. 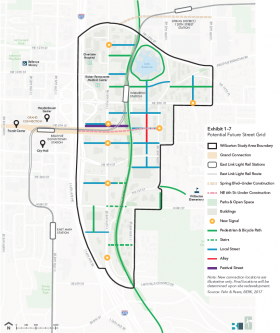 Depending on the quality of cross-highway pedestrian connections, the stations in Bellevue Downtown and East Main may also be convenient for many in the neighborhood. Some other significant transportation decisions may be influenced by the DEIS. These include an extension of the NE 6th St overpass, which today reaches halfway across the highway to the HOT lanes, but could continue to either NE 116th or NE 120th. That would improve travel times on RapidRide B to Crossroads. Also in focus are several street crossings of the Eastside Rail Corridor. The crossing of NE 4th is at grade in all scenarios, but consideration is given to both at grade and elevated crossing of NE 8th. The ‘main street’ of the neighborhood is 116th St, today an intensely auto-oriented arterial. The city foresees modest improvements to the street environment, with five lanes of auto traffic remaining, but added buffered bike lanes and improved sidewalks. The vision for the area sees the trail on the Eastside Rail Corridor as the primary walk and bike route. Excepting the Sound Transit portion between NE 4th and Northup Way, most local improvements to the corridor are likely to be complete by 2020. All development alternatives in the DEIS envision a much denser street grid. 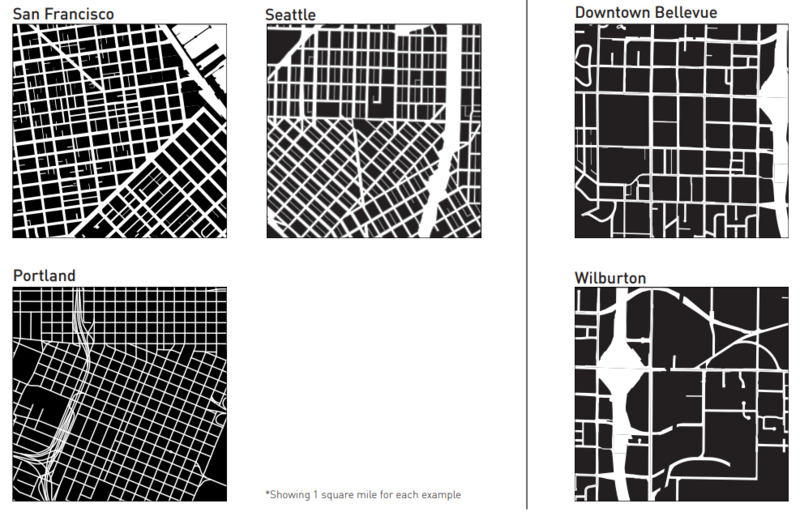 Wilburton’s grid is weak even by Bellevue standards, as the effect of typically long Bellevue super-blocks is compounded by missing streets, particularly east to west. Street crossings are too far apart for a pedestrian neighborhood; on 116th Ave NE, it is 1550 feet from NE 8th St to NE 4th St. Adding many more minor neighborhood streets, and crossing points on arterials, is therefore essential. Interestingly, the DEIS also suggests a series of pedestrian connections to the Eastside Rail Corridor, so the more complete street grid is enhanced by non-motorized east-west pathways. The challenges to success in Wilburton are not small, and today’s commercial area is far from the urban neighborhood the city wishes to see. But Bellevue is appropriately encouraged by the accelerating pace of urban development in the Bel-Red corridor. Wilburton is within sight of some of the region’s most expensive office space and high-rise luxury housing across the highway. With the right development standards, urban infrastructure, and connections to Downtown, the chances of success in Wilburton are high. Thanks!. Worked for me, but may be an issue with mail client configurations. I added the instructions in text. Why is there no separated pedestrian crossing on 116th St to get between the hospitals and Link at Wilburton? NE 10th is set up like a nice pedestrian street so making people (including sick people seeking medical care) suddenly ford across a wide 116th with lots of turning cars seems cruel. I’m not too sure how useful RapidRide B will be once EastLink opens. I would also think that RapidRide B riders headed to Seattle would want to transfer at Wilburton if the connections were decent. Yes, but there’re also RR-B riders headed to downtown Bellevue. Metro’s long-range plan breaks the RR-B into one route on NE 8th and another from Eastgate to Redmond along 148th and 156th; Bellevue’s TMP did the same and extended the NE 8th route to Bellevue Square, which I think is a great idea. And on top of that, we could reroute the 271 onto the Sixth Street Bridge, too. Either way, there’re going to be riders crossing 405 on buses. Extending RapidRide B to Bellevue Square seems to be logical. I would consider going further — either south to Old Bellevue and maybe even down Bellevue Way to South Bellevue, or north to Kirkland. The concept of RapidRide is best for trips between 2-6 miles. Shorter distances are fine using local buses and longer distance are better on limited stop routes. As far as the NE 6th crossing goes, the roadway will be popular with drivers dropping off or picking up people at Downtown Bellevue Station. They will be HOVs before the Link rider hops out or after the Link rider is picked up. So how will eastbound RapidRide B buses drop off riders at Wilburton and then turn left at the congested 116th St NE intersection? Splitting the B is in the 2040 plan, so it will be at least a decade after East Link opens. Given the rate of construction, at least some of the upzone will be built up by then. I assume 116th will be the most attractive to developers. I’m not too sure how useful RapidRide B will be once EastLink opens. RR-B connects Crossroads with Redmond and DT Bellevue. The only portion that would overlap East Link would be Overlake to DT Redmond. That section is still a long, long way into the future. For several years after East Link opens that leg will see a huge bump in ridership. I still think the roundabout route through the warehouse district is silly. It would serve more people and be faster to take Old Redmond Rd from 148th. FYI, the area north of Crossroads and the area bordering the triangle between 156th and Bel-Red Rd (southeast of the Microsoft campus) is currently seeing a huge boom in mixed use and multifamily development. I also found out yesterday that the Sears in Overlake is set to be replaced with more mixed use development. Can you say gridlock? I knew you could. Not really. I’ve not-infrequently taken the RR-B between Overlake and downtown Bellevue, simply because it’s the fastest frequent route there. Judging by boardings, I don’t think I’m alone, either – and once East Link opens, we’ll all switch to the train. Though, yes, Crossroads will still give a lot of demand. 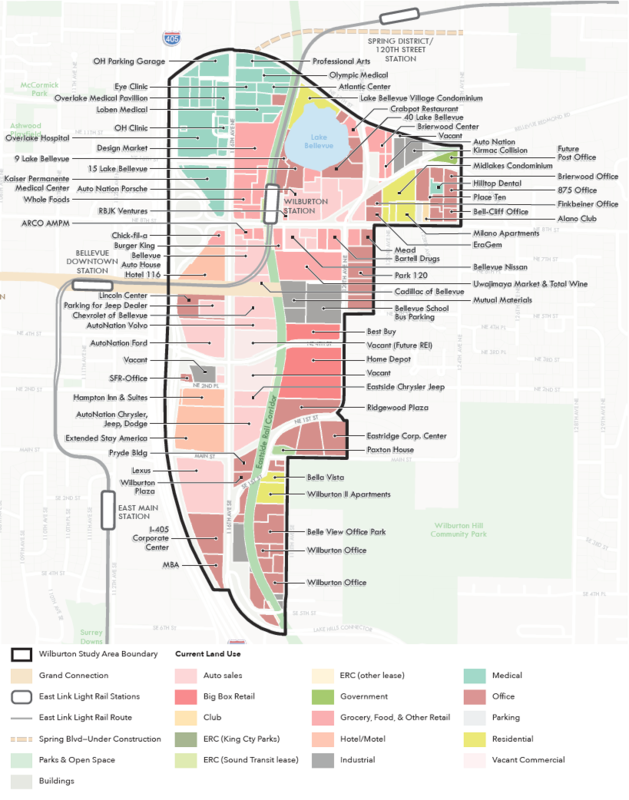 The redevelopment centered around Sears is called Overlake Plaza: https://www.redmond.gov/common/pages/UserFile.aspx?fileId=217828. It is half a mile from the future Overlake light rail station. There will also be a pedestrian bridge over the 520 to Microsoft, and a street overlay. Spring Boulevard will also be important for relieving traffic from BelRed Rd: https://transportation.bellevuewa.gov/projects/belred-transformation/n-e-spring-blvd/. I think traffic patterns will be different but not necessarily worse. Interestingly, Seritage is the subsidiary of Sears that is selling off its stores one by one for redevelopment. I guess their corporate strategy is to keep each store’s doors open long enough to get a developer to build out the site. Just southeast of the area of Portland shown in the images, there are several superblocks similar to what is shown for Wilburton. However, in those blocks the street grid is maintained but as pedestrian only streets. Witness 2nd Avenue at SW Montgomery Street. Something like that might be a valid alternative vision rather than adding auto accessible streets. Well, OK, probably without the stairs. That reminds me of Moscow. The people I stayed with lived 5-10 blocks from an outer metro station, and part of it was a pedestrian path. In between were small Soviet-era shops (Milk, Meat, Bread) in stallinesque mixed-use buildings. A streetcar line ran from the metro to closer to the building; I don’t remember how much I used it. Whatever a building looks like, and it’s original purpose, if it’s strong and with a lot of room- including by either adding or removing walls and floors, it’ll have a lot of different uses over its lifetime. Same with its occupants income, and their way to earn it. Pet hate of mine is old clean-sanded brick and wrought iron, and immobilized machine a hundred machine-years old…right up against a white table-cloth no factory worker could’ve earned over a hundred years. Good thing division of wealth was so much fairer then than now. Also many more buildings than now had secret hallways and basements. Which hopefully nobody discovers, because it will now cost so much more for a table one of them. Still and all- definitely separates pedestrians from traffic if somebody does discover one. The walls are concrete so they should be there a long time and they’re hard to remove. As for “lot of room”, ha ha, the rooms are size-challenged. If nobody knows about the secret hallways, isn’t that like an invisible cat on a chair, or a tree falling in a forest where there’s nobody to hear it, or the universe if there were no humans to recognize it as a universe? I’m sure you’ve heard about Moscow’s Metro 2. That is a very nice neighborhood. It’s accessible to transit but so quiet because cars are kept out. Agreed. What exactly is the process in Bellevue for adding streets to its urban core? The current grid system is not all that different today from when I worked in Bellevue in the 90s. For major streets, they’d buy, if necessary via eminent domain. This was the process for NE 4th. For minor streets, a developer can be required to add through streets. That’s one of the advantages of having a single property holding a block deep. I don’t think it’s been a priority in downtown in the past. But the Spring District has been adding streets, both city-built and developer built. The zoning standards recently adopted for downtown encourage more through-block connections for pedestrians, but that’s just a few months old. Are through-blocks connections required or simply encouraged? Thanks for the reply. What I was actually inquiring about was the internal processes in place at PDS (or whatever Bellevue calls their planning department) and how they move forward with plans that require additional ROW for new streets and/or arterials, whether that be through puchase agreements or condemnation actions. For instance, at what level of development are such plans before the appropriate council committee needs to be involved and ultimately give approval for their advancement? I’m assuming the starting point is the city’s adopted 6-year TIP but beyond that I’m not all that familiar with the process in place in Bellevue (as opposed to what I know about the process in place here in my own county, Snohomish). In regard to your examples, I’m assuming you’re referring to the extension of NE 4th that required a condemnation action for the Best Buy property. 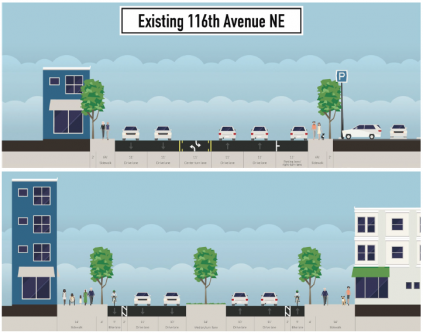 When I get a chance, I’ll dig a little bit into some of the planning details concerning Bellevue’s current project of creating this short new east-west segment for NE Spring Blvd, mentioned in your reply and updated in the link below. Anyway, thanks again for your reply. How do people on the ERC cross 8th St. to get to the link station? I hope the answer is something other than “everyone detour to 116th and wait three minutes for the walk signal. But I do see in the Wilburton documents consideration of a grade-level crossing. The thinking seems to be that a more urbanized station area requires a calming of traffic which would make a grade-level crossing more feasible. That might be instead of, or in addition to, the elevated crossing. Interesting. Doesn’t look like wilburton station will have a mezzanine though, so I guess a trip to the station from the south of 6th will require an up-down-up. Doesn’t Wilberton get a second station, part of the line that goes out to Issaquah? Wilburton platform will be elevated, so an elevated crossing of 8th would not require train passengers to descend after crossing. However, some of the planning commented that the elevated crossing is less desirable for cyclists using the trail as the ramp will be so long they won’t actually spend much time at street level between street crossings. As part of the ST3 extension connection to Kirkland South, Wilburton will get a second platform. It will be the last station before the line splits north towards Kirkland, east towards Redmond. @Dan – after I replied, I looked at your image of the ERC crossing, and it appears not to be joined to the station…so to get to the platform a commuter would have to ascend the bridge, cross, NE 8th, descend from the ERC, then ascend to the platform. Is that right? on 116th Ave NE, it is 1550 feet from NE 8th St to NE 4th St. There is already a signal and crosswalks at 116th and NE 6th. It will become decidedly less pedestrian friendly if/when NE 6th is extended. Good luck with traffic calming on NE 8th. I think it’s 7 lanes wide where the ERC crosses. Kirkland is already building an elevated crossing at Totem Lake (NE 124th) which has virtually no pedestrian demand in comparison. Oops. I was thinking of the signal on 120th Ave NE, not 116th. Also, the above comment should have been in reply to Ryan’s post above. Since when did “Wilburton” extend so far to the North? It certainly didn’t when I was growing up in Bellevue. And “Overlake” apparently extends from Overlake Hospital to Microsoft. Actually I believe the original Wilburton lumber mill was somewhere around the junction of NE 8th and 116th. Back then I’m not sure what if anything was in the area of SFH now signposted as Wilburton. Back when Bellevue was one of several small towns in that part of the eastside, Overlake was a collective term used for the area. It has all but fallen out of use, and Overlake Hospital is one of the few examples left. It’s definite neighborhood creep. The traditional and “official” neighborhood boundary is NE 8th. But I think the City wants to eliminated the name Bel-Red and replace it with more upscale names like The Spring District. This area was known as Midlakes; the name on the old Post Office and still born by a few businesses. Not sure how Overlake Hospital got it’s name since it’s always been at that location ever since it was just a one story building. I only remember back as far as when 520 ended at 148th but IIRC the Sears store was about the only thing out there before Microsoft. Well, there were some large companies along 148th but they were mostly “black holes” that did defense work. I wouldn’t miss the name Bel-Red if they got rid of it…it’s not much of an identity, just a name that borrows from two other places it is between. I think it deserves its own identity – or perhaps it is large enough to be several different places once built out. Overlake Hospital has always been there…the whole area was called Overlake! It’s the same reason the golf course in Medina was named Overlake. I’m not sure when Overlake came to be just the area near Microsoft, but that was later. The name Overlake seems to be primarily a City of Redmond construct. Back when this was all still unincorporated Redmond and Bellevue were engaged in a bit of a turf war trying to annex as much retail taxable property as they could which resulted in some of the checkerboard city limits boundaries. Also, back in the day of land lines and Baby Bells it played havoc with what was/wasn’t long distance (remember long distance calls). No – Overlake was a term applied to the whole eastside. The elementary school that was built where Bellevue’s downtown park is now was called Overlake Elementary. Bellevue School District was originally called Overlake. The predecessor to Sound Transit was call Overlake Transit System (could this be where Overlake Transit Center got its name?) This is why the hospital is called Overlake. Interesting bit of trivia regarding the school names. When someone says Overlake School you immediately think of the elite private school in Redmond. Overlake Transit from what I’m told ran just one route that connected DT Redmond with DT Bellevue. IIRC the Sears store development was originally known as Overlake Plaza. 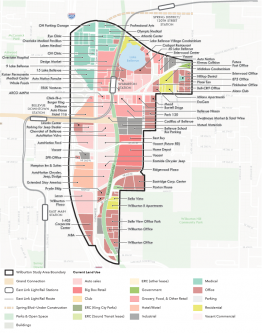 It is only the City of Redmond that formally recognizes this area now as a “neighborhood”. My guess is the term originated as Seattle slang, as in “over the ocean” to reference the great unwashed area across Lake Washington that wasn’t Kirkland. Bel-Red is named after Bellevue-Redmond Road, which runs diagonal because it existed before the street grid. It is a non-name that says there’s no there there, so that’s a good reason to change it. And the road has been broken up on the west side: it’s now diverted to NE 12th Street but it used to go to NE 8th & 120th where the latter is still diagonal, and I assume it continued to Main Street & Bellevue Way. That part may have been obliterated when 405 was built. There is actually a concentration of artists around 130th; the ST rep mentioned it at the East Link open house I mentioned. However, most arts districts are downtowns or adjacent to downtowns, where galleries and performing-arts spaces are. I can’t see Bellevue thinking 130th would be a better place for galleries and theaters than downtown, and home studios alone don’t make an arts district. Birdtail Beads and a head shop is a concentration? The PNB studio is over by 136th and the only other studios I know of in the area are the type that cut hair. And yes, a true Arts District needs to be DT or at least in a walkable neighborhood. The only reason this gets so much attention is PNB spent a small fortune constructing the special floor. I live in Wilburton, and I’m very excited about this development. 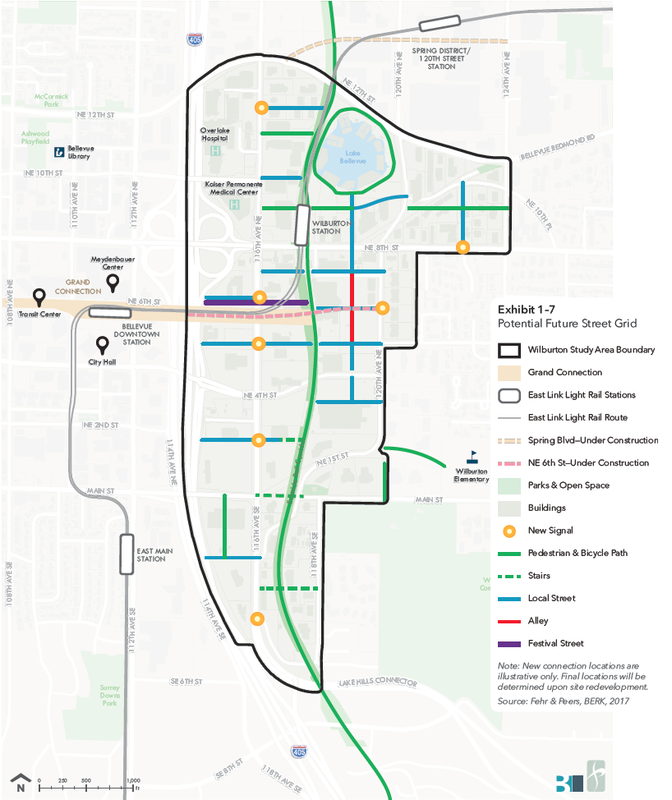 Six new light rail stations will open between East Main and Overlake Village, and with the (partial) exception of downtown there is minimal development along the route. How often does a city have the opportunity to build community from scratch, on something like 2,000 acres of brown field land? The Bellevue of the 1960s was a model for the mid-century vision of a city in a park Now Bellevue has a chance to be the model of a 21st century rail-and-trail-oriented city in a park. there is minimal development along the route. You must not venture as far afield as the Spring District (aka Bell-Red) or Overlake. There’s as many dump trucks as Lexus’. On the contrary, I know the area very well. The current development at Spring District is very small compared to the overall opportunity: BelRed is 900 acres, Spring District is only 38 acres of this. The other 860 acres is largely warehousing, and very few buildings above three stories. 130th Ave between BelRed Rd and Northup Way will start to build out in the next few years, at a similar scale to the Spring District – the first building is in the planning pipeline now. Wilburton Commercial Area is outside of BelRed, and comprises an additional 237 acres. A lot of this is auto retail or car parking, and will soon allow buildings of between 120-250ft – or up to 450ft under alternative 2. This is substantially higher than the Spring District. See pages 2.6 and 2.7: https://planning.bellevuewa.gov/UserFiles/Servers/Server_4779004/File/Planning%20and%20Community%20Development/Wilburton/Wilburton%20DEIS/2_Alternatives_Wilburton_DEIS_2018.pdf. If you think there are a lot of dump trucks now…actually, it has barely begun. A new apartment/condo complex is already occupied on the NE corner of Bel-Red & 120th with neighboring developments close to completion. The UW GIX campus has been completed and is surrounded by more development. The old bank with the cannon got blasted to oblivion just in the last couple of weeks and is undoubtedly going to be more cookies from the same cutter. Another one, not as tall is close to finishing on the south side of Bel-Red farther east. The construction and engineering companies literally can’t keep up. This is in every way a classic boom cycle. You can only turn body shops into boutiques just so fast. All the building going on at the corner of 120th and 12th/BelRed is the same development, by a single builder, plus the train station – that is the Spring District. So far it’s only 3 apartment buildings + GIX; it’s not as big as it looks yet. There are no new apartment buildings on the south side of BelRed east of there, though there are a couple of smaller town home projects. The site where the canon used to be will be town houses, incidentally. That’s about 30% of the total office space in DT Bellevue. The other big name development is the old Group Health site in Redmond. But the entire area from MS to Crossroads is currently being built out. International construction conglomerates have added prefab concrete production facilities on the eastside to try and keep pace with demand. It’s not like Seattle is built out and the excess capacity can just migrate across the lake. True, SFH isn’t being built in Bellevue, in fact the city is loosing SFH, but it’s still going gang busters in Kirkland and vast swaths of forest are being cleared and turned into suburbia in Snohomish County. At an East Link open house in Bellevue I asked why 130th Station exists because there’s nothing there and the proposed P&R is so small it’s a token. The rep said it’s for future growth for when Bel-Red eventually expands. In the meantime it’s circular: the P&R justifies the station, and the station justifies the P&R. I said I’m worried that once you put a P&R there it will be impossible to convert it because drivers will say it’s a necessity. So I would prefer a deferred station if any. But we’re getting a station and a P&R and preparing for growth. The the hole line is going to have lots of development on it except for the Wilburton area, Mercer Island and the large parking oasis known as the SE Bellevue Park and Ride. This would change it to Mercer Island and the large parking lot near mercer island. Will those be the starting height and then additional FAR bonuses add of green buildings and stepbacs?